Kerr Cuhulain’s writing has always been straightforward, strong, and practical. 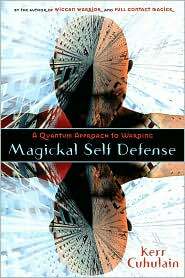 Based on the so-called Witches Pyramid (To Know, To Will, To Dare, To Keep Silent), the Eastern principles of chi energy and quantum science, Magickal Self Defense: A Quantum Approach to Warding continues that strength in this practical and valuable work. Mr. Cuhulain makes a strong case for what some members of the magickal community perceive as psychic attack – an energetic attack by an enemy -- is often not an external force, but an internal reaction to stress, drugs, a negative environment, or even biochemical imbalances. Some of us are very good at creating a negative environment by being extremely solitary and focusing on the ‘bad’ all around us. Please don’t misunderstand, there is a lot of negativity in the world already – politics, finances, work stress, relationship difficulties. But when we focus on the bad – and exclude the good – Cuhulain notes that we can end up creating a kind of negative feedback cycle wherein the negativity feeds and breeds on itself, growing increasingly stronger and more difficult to break out of. That is when it begins to look and feel like we are under psychic attack. To combat such a large amount of negativity – before it becomes an endless feedback mechanism – Cuhulain advises awareness of the self and your environment along with strengthening your will. Awareness of our selves and our environment (To Know and To Keep Silent on the Witches Pyramid as interpreted by Cuhulain) allows us to strength our sensitivity to what is ours and what is coming from others, allowing for appropriate reactions to the ‘threat’. Strengthening our will (To Dare and To Will) is what allows us to enact the appropriate defense. Written in an easy-going but intelligent style, Magickal Self Defense is a valuable resource for any person in the occult community. I especially recommend it to people who are asked for advice on how to ‘deal’ with a psychic attack.